Dylan is a Chartered Accountant. He qualified In Pietermaritzburg after a five year article stint in Ladysmith, followed by a number of years as an accountant for a construction and allied industry-related group of companies. 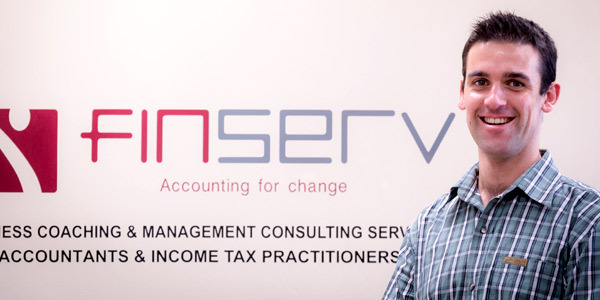 Dylan joined Finserv in the beginning of 2006 and is currently responsible for all the income tax and financial accounting for a range of clients. He has been married to Sheryn since 2006 and they have two daughters. Dylan is also a practicing Christian and active in a local church. Dylan specializes in income tax for individuals and corporate entities; and in the presentation of statutory financial reports. Egbert is a Business Accountant. He has completed a B.Com Finance degree, and a post graduate diploma in management accounting through CIMA. He spent two years working as an audit clerk at a Pietermaritzburg based firm after which he joined the Finserv team in January 2009. He is married to Vicky and they have two sons. Egbert is a practicing Christian and active in a local church. Egbert assists with the income tax for individuals and corporate entities; and in the presentation of statutory financial reports. Louise joined our team in 2007, with the key functions of office administration, client liaison and payroll administrator. She is also responsible for the administrative management of a number of Bodies Corporate, and more particularly commercial property developments. Louise spent 16 years in the insurance industry, starting off at Old Mutual, and subsequently with various independent brokers. She was involved with administration, financial planning and marketing, and her passion in this industry was marketing medical aid and short-term insurance products. She recently completed a Certificate in Financial Planning through Damelin and a Sectional Title Scheme Management course through the University of Cape Town. Louise is married to Tim, and they have 3 daughters. Both are practicing Christians at a local church in Pietermaritzburg. Sheryn first joined Finserv in May 2004 and attended to the income tax and financial accounting for a range of clients. Sheryn married Dylan in 2006 and left the firm at the end of 2008, just before the birth of their first of two daughters. Sheryn is also a practicing Christian and active in a local church. Sheryn specializes in income tax for individuals and assists with the preparation of financial statements. Noreen joined the Finserv team in 2004 and currently serves as a bookkeeper to a number of clients, and assists with the financial affairs of Finserv. She is studying towards a B.Com degree through UNISA. Noreen is married to Jeffrey and they have two children. Noreen and Jeffrey are both actively involved in a local church in the city. Lynelle joined the Finserv team in 2008. She provides a great deal of assistance to Egbert and Dylan with their bookkeeping, tax and various administrative tasks. Lynelle is currently studying towards a business-related qualification, is married and has one daughter. Lynelle is a practicing Christian at a local church. 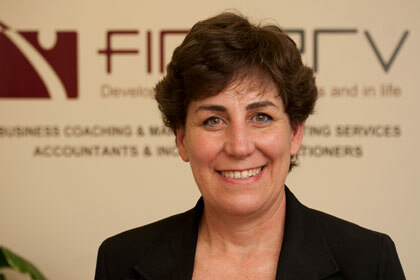 Kim Baldie joined the Finserv team in November 2010 with some twenty years’ front-line client experience. She is currently responsibl­e for managing a busy switchboar­d and reception area. In addition, she provides a great deal of assistance­ to Louise and Noreen with credit control. Kim has one daughter. Moira Pottow is responsible for all our Quickbooks and Vanilla Payroll installations, training and ongoing maintenance. Moira operates out of her business known as Accounting Solutions, but is very much part of our team.